I think I’ve found a swarm. There’s no need to panic though, as long as you leave the bees alone they are not dangerous. If you see a swarm of bees, observe it but do not approach. 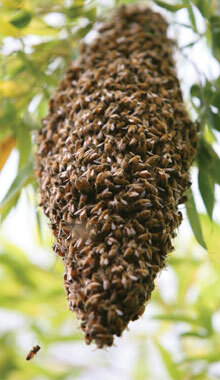 A swarm of bees can comprise of several hundred bees who form a cluster around their queen to protect her. Bees often swarm during May, June or July is a common occurrence. Before calling your local beekeeping association take down a few details. How big is the swarm, is it visible? Some bees will settle on a tree, fence or wall. This is usually a temporary resting place whilst the scout bees search for a more suitable place to set up home. Often you will find they move on after a few days. Beekeepers will only collect honeybees. They will not collect bumblebees or wasps. Bumble bees (large, round, colourful and furry) and other solitary bees (usually black) often take up residence in cracks in walls, compost heaps, and bird boxes and form very small nests, they rarely sting and will usually be gone by the end of summer. Unless they are causing a problem it is usually safe to leave them as they are, after all they are also important pollinators. Wasps and hornets on the other hand, are brightly coloured, aggressive and usually attracted by sugary produce. They can be removed by a pest control company. For more information about bumblebees visit www.beeguardianfoundation.org where you will find a wealth of information, and if that whets your appetite then visit www.bwars.com – the Bees, Wasps and Ants Recording Society – it’s surprising how many different species there are to see. If you are still not sure, please give one of our members a call, who will be able to advise.